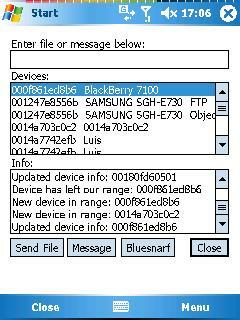 In short btCrawler is a simple bluetooth scanner for Windows Mobile based devices. It scans for other visible devices in range and can perform a service query. 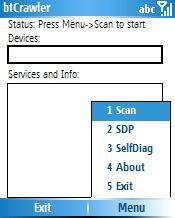 You can also query for services of your own device and do some selfdiagnostic stuff. 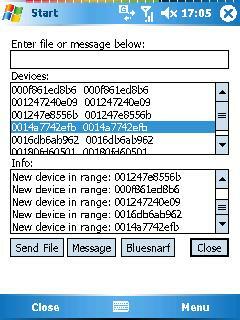 In the device list: COD means “Class of Device” (see bluetooth specification for more info). In the output window, when the sdp services are listed, “ChId” means Channel ID, which is the RFCOMM Channel the service is listening on. It supports both, landscape and portrait screens. As of version 1.0 bluejacking and bluesnarfing is supported. If you don’t know how to create a registry key under CE, then please use your favorite search engine. I will NOT answer any more mails about this. After that start btCrawler and click on the “Transfer” button. You will then see a new button called “Bluesnarf”. If you have successfully bluesnarfed a phone the results are saved in a file in vCard format. You can find a new file called “Bluesnarf.txt” in your root folder. NOTE: If you have Bluesnarfing enabled, be responsible. Use it for educational purposes only! I can not be held responsible for anything you do with this code!!!. – Added bluetab exploit (to activate create a dword with the name “ISC-Sploits” and a value of “1” under HKCU\Software\Microsoft\Bluetooth\Mode) Then you will have a new Button in the main screen. There you can active the bluetab sploit. (Reference: Google for Qnix and bluetab) BE RESPONSIBLE!!! – This is a beta release. Some things may work, others not…If you find a bug, please send me an email. – Redesigned the Smartphone UI. Handling should be better now. – Fixed a problem on Smartphone with “Action”-button exits the program. – Horizontal Scrolling on Smartphone does not work. – Rezising of the GUI due to display orientation change is not working. You have to change to your preferred display orientation before starting btCrawler.